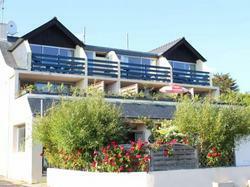 Offering a restaurant, L'Oasis Bretonne is located in Arzon. Free WiFi access is available. Each room here will provide you with a terrace. Private bathroom also comes with a shower. Extras include bed linen. At L'Oasis Bretonne you will find a terrace and a bar. Other facilities offered at the property include meeting facilities and a shared lounge. The property offers free parking.